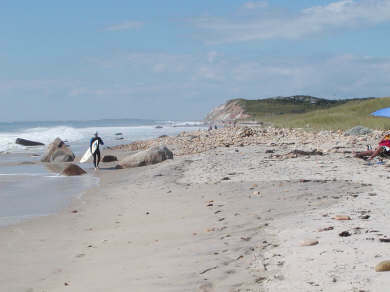 Permits are issued to Town Residents and renters of Aquinnah only. Known for its surf, it is a popular place for surfboarders. The shoreline is a bit rocky, but the expansive views of the Atlantic Ocean are gorgeous. At the base of the clay cliffs with views of No Man's Land, Cuttyhunk and other Islands. You can walk for miles along the gorgeous shore. Waves were great for surfing too!